Reclining in a chair regal enough for a man who has sold 35 million records, Tommy James seems relaxed and easygoing. The story he tells, however, conjures up an auto race, with its breakneck speed and sharp twists and turns. And one is frequently reminded, as Tommy reminisces, that even the guy in the lead may be flagged into a pitstop, that even the most steel-nerved driver can crash. Having survived a major crash, Tommy has slowed his pace so that he can determine more of the factors governing his race. One senses, from his conversation, that a firm hand now grips the steering wheel, a pair of experienced eyes keep watch on the controls and the driver knows the road. 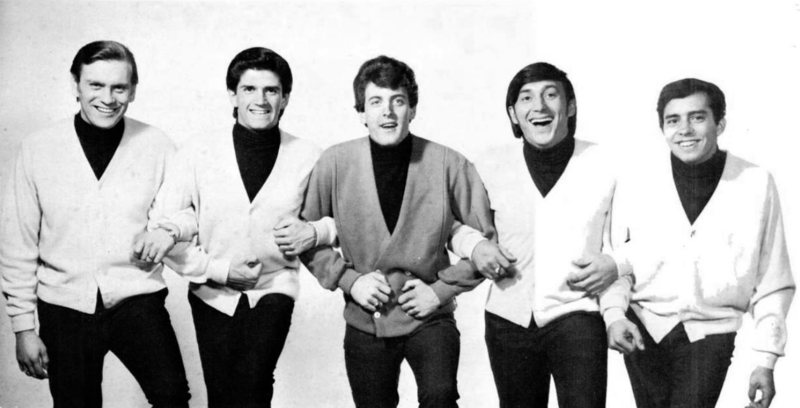 Only weeks before “Hanky Panky” made Tommy James a household name, he graduated from high school and began pursuing a full-time music career. Though he realized that stiff competition rendered his chances for success rather slim, he wasn’t about to let the odds interfere with something he’d worked toward ever since he’d taken up guitar at the age of 9. Throughout junior high and high school in Niles, Michigan, Tommy had performed with a band. A job in a local record store during the same period had given him a first glimpse of the business side of music. And, when he was 13, Tommy had even tried his hand at record-making. It was a casual thing, a few sides cut on mono tape recorded at the request of an area DJ. But the session had resulted in a single, “Hanky Panky,” which sold 10,000 copies around Michigan before fading away for lack of a national distributor. This flirtation with success buoyed up Tommy’s hopes when, five years later, he finished high school, moved to Chicago and began playing in several of its smaller clubs. He didn’t expect instant stardom but was confidently preparing himself for what might come in the future. The future arrived almost immediately in the form of a phone call from a Pittsburgh record promoter. “Your song’s number one here,” Tommy recalls the man as having said. Impressing the Roulette label with the volume of these sales, Tommy was able to interest the company in buying the master disc and giving him a record contract. Then, with a quickly assembled group of musicians, he high-tailed it out of the Windy City to Pittsburgh, where he hoped to enlarge the groundswell for “Hanky Panky” and thus propel it onto the national charts. Tommy’s follow-up singles, recorded with the Shondells, proved that he was anything but a one-shot phenomenon. In early 1967, “I Think We’re Alone Now” zoomed up the charts. Later that year, Tommy and his group scored again with “Mirage,” “I Can’t Take It Anymore,” “Getting Together” and “Out of the Blue.” Their 1968–69 hits included “Mony Mony,” “Sweet Cherry Wine,” “Crystal Blue Persuasion,” “Ball of Fire” and the worldwide smash, “Crimson and Clover.” Only a few years after an apparent fluke had given Tommy his first chart record, he was one of the very top-selling artists in the business. But then, in 1970, the successmobile screeched to a halt. There were no new hits and, by mid spring, there was no longer a group to produce them. “Look, it’s an ugly, gruesome story,” says Tommy. “A really ugly story. I’ll just tell you that the reason the Shondells and I broke up was because, uh . . . well, because I was a junkie. And you can’t function being a junkie. “The pace had been so frantic,” he recalls, “and drugs were what had allowed me to keep it up. Between deciding what my albums should sound like, recording, writing, performing, and all the other things I had to take care of, it was a 24-hour job. And adrenalin just wouldn’t do it all. So I got into drugs. But now I was falling apart. Tommy did not enter a metadone program or even seek help; he simply stopped taking drugs. “I have a tremendous ability to give things up,” he states. “I have to find a reason to do it, but once I’m through, I’m through. Able to function again, Tommy returned to his work, but he didn’t get back to normal for a long while. “At first, I was really groping. I didn’t know what kind of music I wanted to do and my head was still confused. The magic seemed to be gone. And writing songs straight was like pulling teeth. You know, every line. My attention span was like 10, 15 minutes. For that reason, Tommy spent eight months polishing one song, “Draggin’ the Line.” (“Even though it’s really simple.”) Either his self-doubts were unfounded or his special efforts paid off or both, because “Draggin’ the Line” was a giant hit, one of Tommy’s biggest. But he was still not fully satisfied with his lot. For one thing, an attempt to reunite the Shondells had not panned out, and he was working with an assortment of studio musicians on an unsteady basis. In addition, he was becoming dissatisfied with his record company, Roulette. He believed it was concentrating on bargain-bin cutouts and failing to promote his new material sufficiently. Most importantly, he felt that his music was not his music. “I don’t know how to put this delicately. I was locked into a situation where my producers were good friends of mine, and I didn’t want to hurt them. I did feel a certain amount of loyalty to them—they did help me make it. But musically, it was not me. They’d been taking me in a totally different direction than I would’ve gone in had it been my option. “Like ‘I Think We’re Alone Now’ was supposed to be one record. I mean, we weren’t supposed to base our entire sound on that. That wasn’t the idea, but that’s what happened. And most of the time, I couldn’t write about my moods. Except maybe a song that couldn’t be sold as a 45 and would get lost on an LP. But that’s all history: the music for which Britannica credited him and others faulted him, the drug-taking, the Shondells, even the album contract with Roulette. Tommy has formed a new group and signed wiht a new record label. For the 27-year-old musician, 1974 feels like a chance for a fresh start. Though Tommy gained production control only shortly before his bout with drugs, he fondly recalls his studio work during that brief period. “The first record I wrote and produced myself was ‘Crimson and Clover’ and I remember how much fun I had with it. I played every instrument myself except the bass and drums and I sang all the voices.